Download "Joel R. Norris * Scripps Institution of Oceanography, University of California, San Diego. ) 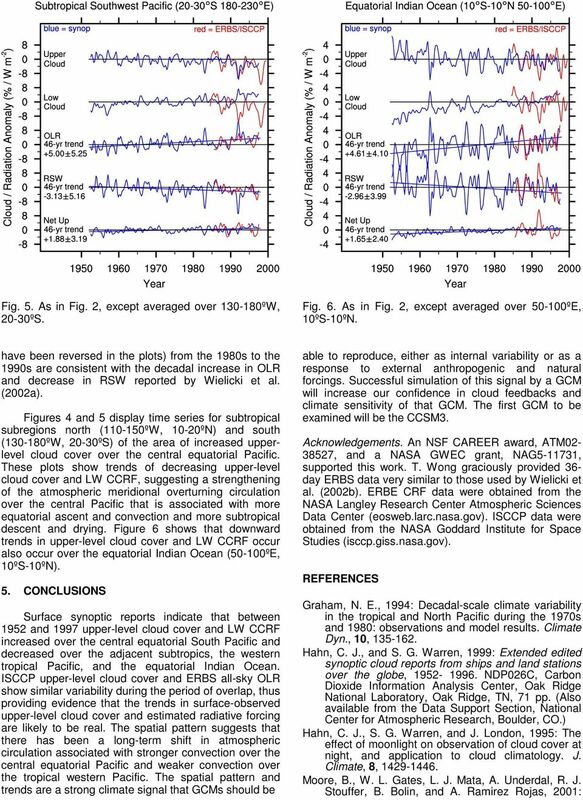 / (1 N h. = 8 and C L"
1 10.4 DECADAL TROPICAL CLOUD AND RADIATION VARIABILITY IN OBSERVATIONS AND THE CCSM3 Joel R. Norris * Scripps Institution of Oceanography, University of California, San Diego 1. INTRODUCTION Clouds have a large impact on Earth s radiation budget because they typically reflect more shortwave (SW) radiation and emit less longwave (LW) radiation to space than does the unobscured surface. Despite their importance, the sign and magnitude of cloud feedbacks on the climate system are some of the largest uncertainties of future climate change. At present it is not known whether cloud cover, cloud reflectivity, and cloud height will change in such a way as to mitigate or exacerbate global warming (Moore et al. 2001). In large part because they do not correctly and consistently simulate clouds, global climate models (GCMs) do not agree on the future magnitude of global warming. Therefore it is essential to determine whether GCMs reproduce cloud and radiation variability observed over the past fifty years, a time period of rapidly increasing anthropogenic forcing on the climate system. Future predictions of climate change by GCMs will be more believable if GCMs, when forced by historical anthropogenic and natural forcing, also simulate observed cloud and radiation changes since Of course, it is possible that observed cloud and radiation changes have not been externally forced, and in that case, an ensemble of GCM output can be examined to see if internal variability with the same magnitude and time scale is simulated. This particular study compares cloud and radiation variability over the tropical Indo-Pacific region during to output from the Community Climate System Model Version 3 (CCSM3). Only observational results will be presented in this extended abstract because CCSM3 output is not yet available. 2. DATA The Extended Edited Cloud Report Archive (EECRA) (Hahn and Warren 1999) provides individual surface synoptic cloud reports using a consistent observing procedure over ocean during Synoptic code cloud parameters are N (sky cover by all clouds), N h (sky cover by the lowest cloud layer), C L, C M, and C H (cloud types at low, middle, and high levels), and ww (present weather) [WMO, 1987]. Only daytime observations are used since human observers have difficulty identifying cloudiness under conditions of poor illumination (little or no moonlight) (Hahn et al. 1995). Upper-level cloud cover, defined in this study as the coverage by midlevel and high-level clouds, was inferred by assuming random overlap with obscuring * Corresponding author address: Joel R. Norris, Scripps Institution of Oceanography, La Jolla, CA ; lower-level clouds, i.e., upper-level cloud cover = (N N h ) / (1 N h ). In general it is not possible to separately calculate midlevel cloud cover and high-level cloud cover since only total cover (N) and lowest-level cloud cover (N h ) are reported. Random overlap assumes that upper-level cloudiness covers the same relative fraction of sky where it is obscured by lower clouds as where it is not obscured. Upper-level cloud cover was set to 100% due to identification of nimbostratus in the case of sky obscuration (N = 9) or overcast low-level cloudiness (N h = 8 and C L = 1-9) with non-drizzle precipitation (ww = 60-75, 77, 79-99). Since shallow clouds can nevertheless drizzle, the presence of drizzle precipitation did not lead to the identification of upperlevel nimbostratus unless the overcast low-level clouds were cumulonimbus or bad-weather stratus (C L = 3, 7, 9). No determination of upper-level cloud cover could be made in other cases of overcast low-level cloudiness or sky-obscuration, and this study assumes that average upper-level cloud cover is the same for when it cannot be seen as when it can be seen. Surface-observed low-level cloud cover cannot be directly compared to satellite-observed low-level cloud cover because higher clouds often block the satellite s view of low-level clouds. EECRA low-level cloud cover values were therefore adjusted to represent the satellite view by removing the portion of low-level cloud cover overlapped by higher clouds. This was accomplished by subtracting upper-level cloud cover from total cloud cover. Earth Radiation Budget Satellite (ERBS) nonscanner data provides measured outgoing LW radiation (OLR) and reflected SW radiation (RSW) at grid resolution for the time period (Wielicki et al. 2002a). OLR and RSW fluxes were corrected to account for variations in satellite altitude using coefficients provided by T. Wong (2004, personal communication). Clear sky radiation fluxes are not available, so the cloud impact on top of atmosphere (TOA) radiation cannot be directly observed. The ERBS orbit precessed through 12 hours of local daytime and nighttime sampling over 36 days, and averaging over monthly time periods aliased the diurnal cycle of reflected SW radiation into an apparent semiannual cycle in previous studies. Averaging over 36-day intervals eliminates this problem (Wielicki et al. 2002b). The sampling uncertainty of OLR data is less than the sampling uncertainty of RSW data because the former does not experience such a large diurnal cycle. To further reduce sampling uncertainties, the climatological seasonal cycle was removed and the available 36-day anomalies were then averaged to 72-day anomalies. ERBS data are completely missing during the second half of 1993 and during several shorter periods in 1998 and 1999. 2 The International Satellite Cloud Climatology Project (Rossow et al. 1996; Rossow and Schiffer 1999) provides cloud fraction, cloud top pressure, and cloud optical thickness information retrieved from geostationary and polar-orbiting weather satellites from July 1983 onwards. High clouds are defined as those with tops above the 440 hpa level, midlevel clouds as those with tops between 680 hpa and 440 hpa, and low-level clouds as those with tops below the 680 hpa level. These height categories are further divided into individual cloud types according to visible cloud optical thickness. This study defines upper-level cloud fraction as the sum of ISCCP high-level and mid-level cloud fraction. ISCCP low-level cloud fraction takes into account only those low clouds that are not obscured by higher clouds. Only ISCCP daytime data are examined since ISCCP may have trouble correctly detecting cirrus or low-level clouds using the IR channel alone. Monthly ISCCP D2 data at grid resolution were averaged to 72-day data at grid resolution with weighting according to area and the number of days in each month contributing to a 72-day period. Individual EECRA data were similarly averaged to 72-day data at CLOUD COVER RADIATIVE FORCING (CCRF) In order to determine the radiative impact of trends in cloud cover, LW and SW radiation anomalies associated with of surface-observed cloud cover anomalies were empirically estimated. These estimated radiation anomalies will be called cloud cover radiative forcing (CCRF) anomalies since they are similar to but not the same as regular cloud radiative forcing (CRF) anomalies, which include effects of anomalies in cloud albedo, emissivity, and other properties in addition to cloud cover. Because clouds generally reduce OLR and increase RSW relative to clear sky, LW CCRF is positive and SW CCRF is negative. LW CCRF anomalies were estimated by multiplying upper-level cloud cover anomalies by the long-term seasonal mean value of ERBE LWCRF per unit cloud cover at each grid point. SW CCRF anomalies were estimated by multiplying upper-level and low-level cloud cover anomalies by the long-term seasonal mean values of ISCCP upper-level and low-level cloud albedo and insolation at each grid point. Earth Radiation Budget Experiment (ERBE) broadband albedo values are less than ISCCP narrowband visible albedo values due to solar absorption at near IR wavelengths. This was taken into account by scaling ISCCP upper-level and low-level cloud albedo values by the ratio of ERBE total cloud albedo divided by ISCCP total cloud albedo. The preceding procedures for estimating CCRF from surface cloud observations assumed a linear relationship between CCRF anomalies and cloud cover anomalies that was identical to the ratio of climatological CRF to climatological cloud cover. Variations in cloud albedo, cloud emissivity, and cloud top temperature were not considered, except for climatological geographical differences and the seasonal cycle. Effects of varying greenhouse gases, aerosols, and other environmental properties were also not explicitly included, but effects of certain atmospheric constituents, such as water vapor, may be implicitly included if they happen to co-vary with cloud cover and LWCRF. 4. OBSERVATIONAL RESULTS Figure 1 shows the geographical distribution of trends in upper-level cloud cover. An increasing trend in upper-level cloud cover occurs over the central equatorial South Pacific and decreasing trends in upper-level cloud cover occur over adjacent subtropical regions, the western tropical Pacific, and the equatorial Indian Ocean. Previous studies have documented precipitation trends and a shift in atmospheric circulation that are consistent with a strengthening of convection over the central equatorial Pacific and a weakening of convection over the western tropical Pacific (e.g., Graham 1994; Nitta and Kachi 1994; Morrissey and Graham 1996). More convection over the central equatorial Pacific ocean is consistent with increased upper-level cloud cover locally, and an increase in compensating descent to the north and the south of the convection region would reduce upper-level cloud cover in adjacent subtropical regions. Less convection over the western tropical Pacific is consistent with decreased upper-level cloud cover in that area. It is interesting to note that the trends in cloud cover are much larger than what would be expected from the interannual relationship between cloud cover and El Niño. 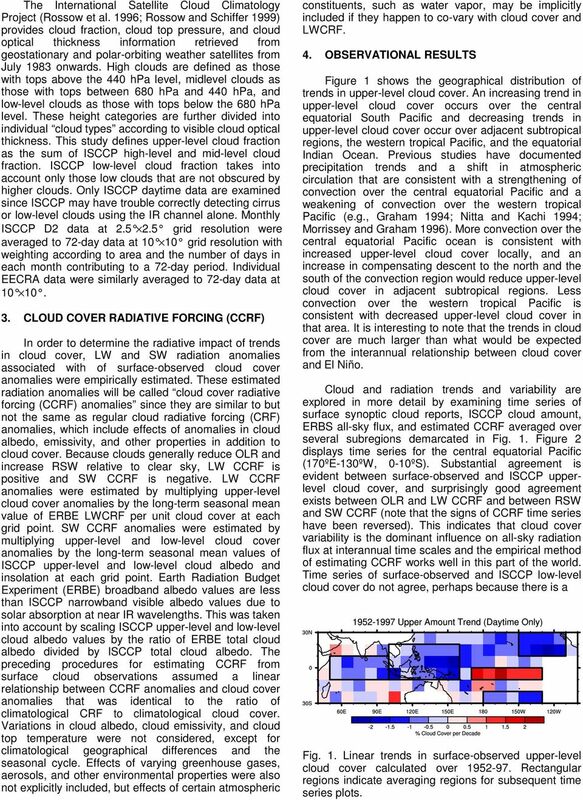 Cloud and radiation trends and variability are explored in more detail by examining time series of surface synoptic cloud reports, ISCCP cloud amount, ERBS all-sky flux, and estimated CCRF averaged over several subregions demarcated in Fig. 1. Figure 2 displays time series for the central equatorial Pacific (170ºE-130ºW, 0-10ºS). 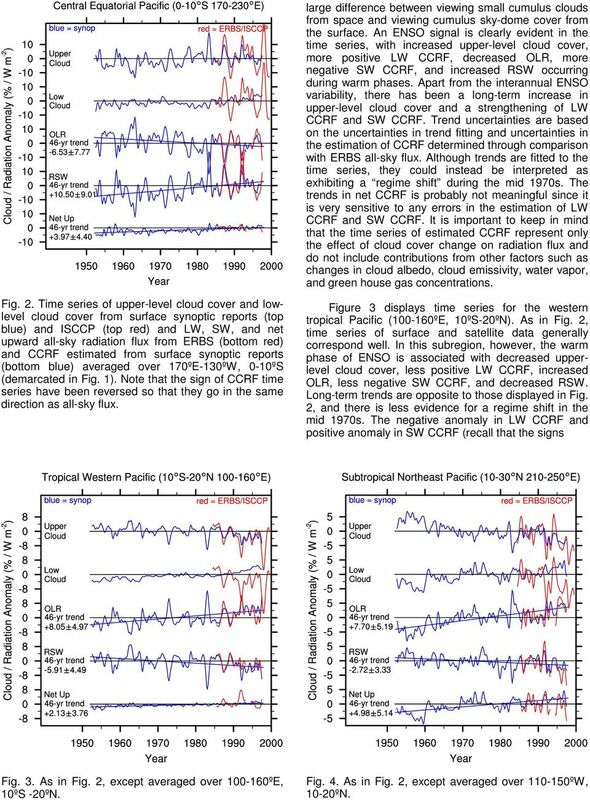 Substantial agreement is evident between surface-observed and ISCCP upperlevel cloud cover, and surprisingly good agreement exists between OLR and LW CCRF and between RSW and SW CCRF (note that the signs of CCRF time series have been reversed). This indicates that cloud cover variability is the dominant influence on all-sky radiation flux at interannual time scales and the empirical method of estimating CCRF works well in this part of the world. Time series of surface-observed and ISCCP low-level cloud cover do not agree, perhaps because there is a Fig. 1. Linear trends in surface-observed upper-level cloud cover calculated over Rectangular regions indicate averaging regions for subsequent time series plots. 3 large difference between viewing small cumulus clouds from space and viewing cumulus sky-dome cover from the surface. An ENSO signal is clearly evident in the time series, with increased upper-level cloud cover, more positive LW CCRF, decreased OLR, more negative SW CCRF, and increased RSW occurring during warm phases. Apart from the interannual ENSO variability, there has been a long-term increase in upper-level cloud cover and a strengthening of LW CCRF and SW CCRF. Trend uncertainties are based on the uncertainties in trend fitting and uncertainties in the estimation of CCRF determined through comparison with ERBS all-sky flux. Although trends are fitted to the time series, they could instead be interpreted as exhibiting a regime shift during the mid 1970s. The trends in net CCRF is probably not meaningful since it is very sensitive to any errors in the estimation of LW CCRF and SW CCRF. It is important to keep in mind that the time series of estimated CCRF represent only the effect of cloud cover change on radiation flux and do not include contributions from other factors such as changes in cloud albedo, cloud emissivity, water vapor, and green house gas concentrations. Fig. 2. Time series of upper-level cloud cover and lowlevel cloud cover from surface synoptic reports (top blue) and ISCCP (top red) and LW, SW, and net upward all-sky radiation flux from ERBS (bottom red) and CCRF estimated from surface synoptic reports (bottom blue) averaged over 170ºE-130ºW, 0-10ºS (demarcated in Fig. 1). Note that the sign of CCRF time series have been reversed so that they go in the same direction as all-sky flux. Figure 3 displays time series for the western tropical Pacific ( ºE, 10ºS-20ºN). As in Fig. 2, time series of surface and satellite data generally correspond well. In this subregion, however, the warm phase of ENSO is associated with decreased upperlevel cloud cover, less positive LW CCRF, increased OLR, less negative SW CCRF, and decreased RSW. Long-term trends are opposite to those displayed in Fig. 2, and there is less evidence for a regime shift in the mid 1970s. The negative anomaly in LW CCRF and positive anomaly in SW CCRF (recall that the signs Fig. 3. As in Fig. 2, except averaged over ºE, 10ºS -20ºN. Fig. 4. As in Fig. 2, except averaged over ºW, 10-20ºN. 5 Advancing our understanding. Climate Change 2001: The Scientific Basis, J. T. Houghton, Y. Ding, D. J. Griggs, M. Noguer, P. J. van der Linden, X. Dai, K. Maskell, and C. A. Johnson, Eds., Cambridge University Press, Morrissey, M. L., and N. E. Graham, 1996: Recent trends in rain gauge precipitation measurements from the Tropical Pacific: evidence for an enhanced hydrologic cycle. Bull. Amer. Meteor. Soc., 77, Nitta, T., and M. Kachi, 1994: Interdecadal variations of precipitation over the tropical Pacific and Indian Oceans. J. Meteor. Soc. Japan, 72, Rossow, W. B., and R. A. Schiffer, 1999: Advances in understanding clouds from ISCCP. Bull. Amer. Meteor. Soc., 80, Rossow, W.B., A.W. Walker, D.E. Beuschel, and M.D. 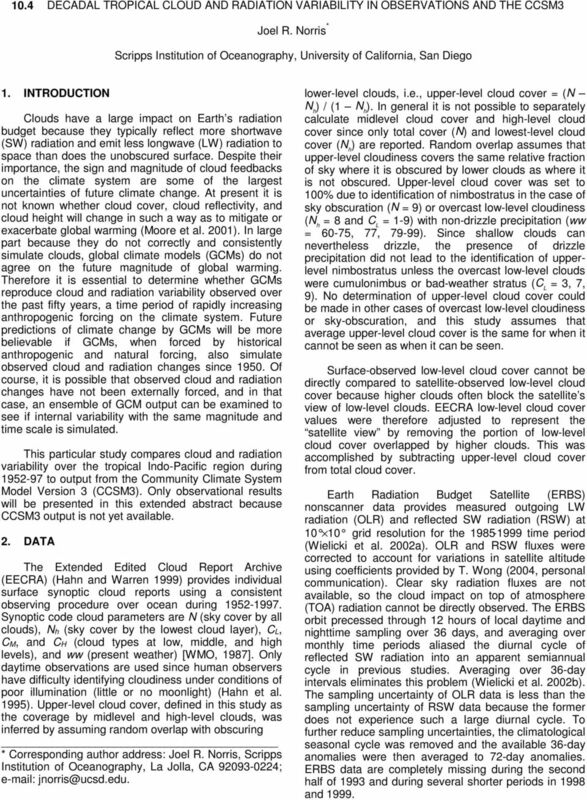 Roiter, 1996: International Satellite Cloud Climatology Project (ISCCP) Documentation of New Cloud Datasets. WMO/TD-No. 737, World Meteorological Organization, 115 pp. [Available at Wielicki, B. A., and Coauthors, 2002a: Evidence for large decadal variability in the tropical mean radiative energy budget. Science, 295, Wielicki, B. A., and Coauthors, 2002b: Response. Science, 296, 2095a. World Meteorological Organization, International Cloud Atlas, Vol. I, WMO Publication 407, 212 pp. A Climatology of Surface Radiation, Cloud Cover, and Cloud Radiative Effects for the ARM Tropical Western Pacific Sites. Interactive comment on Total cloud cover from satellite observations and climate models by P. Probst et al. Comment on "Observational and model evidence for positive low-level cloud feedback"
Comparison of NOAA's Operational AVHRR Derived Cloud Amount to other Satellite Derived Cloud Climatologies.